Home » Videos » Bandit The Pit Bull Has A Big Heart For Such A Little Pup, So Funny! Bandit The Pit Bull Has A Big Heart For Such A Little Pup, So Funny! The funny clip below that features pit-bulls at a dog treadmill originated from one rescue and training organization which is located in Las Vegas. Bandit is the name of the little dog. One adult member is exercising and on the treadmill and the little pup is determined to know how everything is done. It shows us how dogs are able to use their instincts to make new discoveries. That is what it means to pay attention to every detail. In the background, Survivor’s “Eye of the Tiger” is playing and it seems the tune of the song is helping a lot as he attempts to learn. Although he makes several attempts and fails, he does not lose hope at once, he still keeps on observing and towards the end he almost succeeds. By watching him, we must learn that no matter how hard a task appears to be, with a big heart everything is possible. 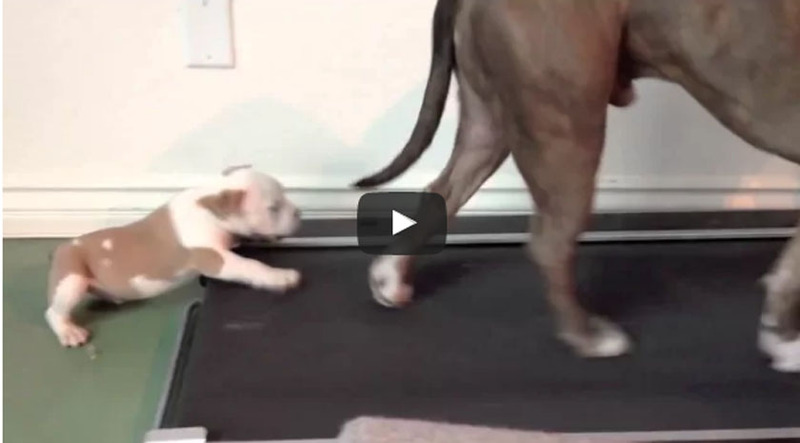 We hope you loved watching the little dog’s determination to use the treadmill. Did Bandit make you smile while watching the funny clip? You can support Peace, Love, and Pit Bulls, which is the organization behind the rescue as well as the protection of dogs within Las Vegas. Please SHARE and make a friend smile!